The Beta – tbeta – IT”S HERE!!! 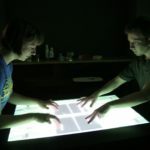 New mac/win/linux multitouch tracker! Mac anyone? 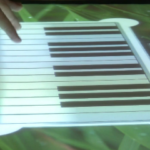 New multitouch tracker on it’s way! MultiKey Updates…it works with a mouse too! No, I haven’t forgotten about the other programs that I first started on. 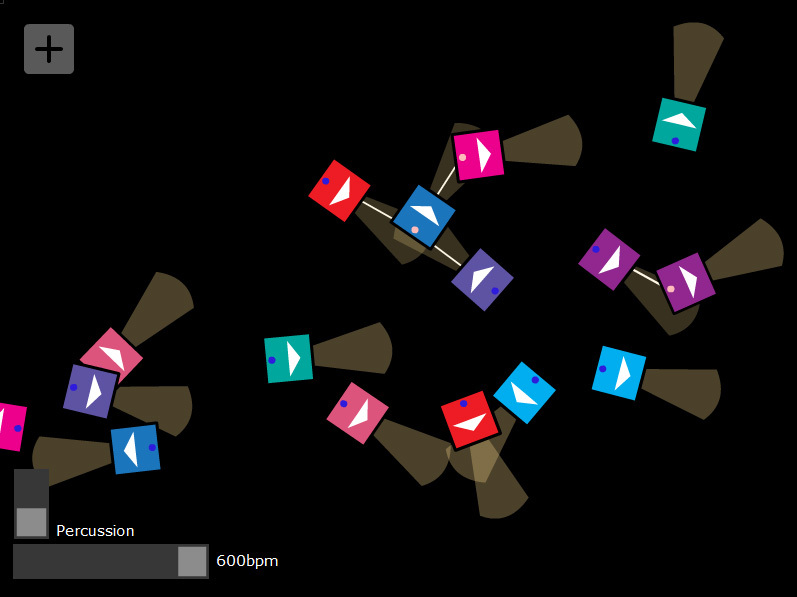 I’m still developing Audioshape Sequencer as well as Musical Squares, but recently I have made some big changes/additions to the MuliKey application. I think all of the changes are great improvements and will allows for much more functionality and experimentation within a simple application like MultiKey. 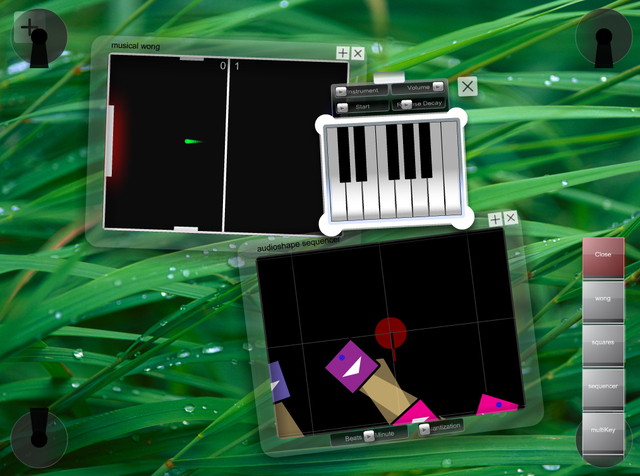 Audioshape Sequencer is modeled after Tangible Sequencer and originally inspired by Nicolas Clavaud.This application works with a mouse and/or multitouch table (touchlib/tuio simulator or other TUIO program). There are three main things to know about the program. and sensor (Blue dot on square. Pink when activated). Current progress. Side walls are ready, but not attached yet. I went to home depot and picked out some wood that would be good enough for the inside framing of the table. I tried to get something light weight and sturdy. 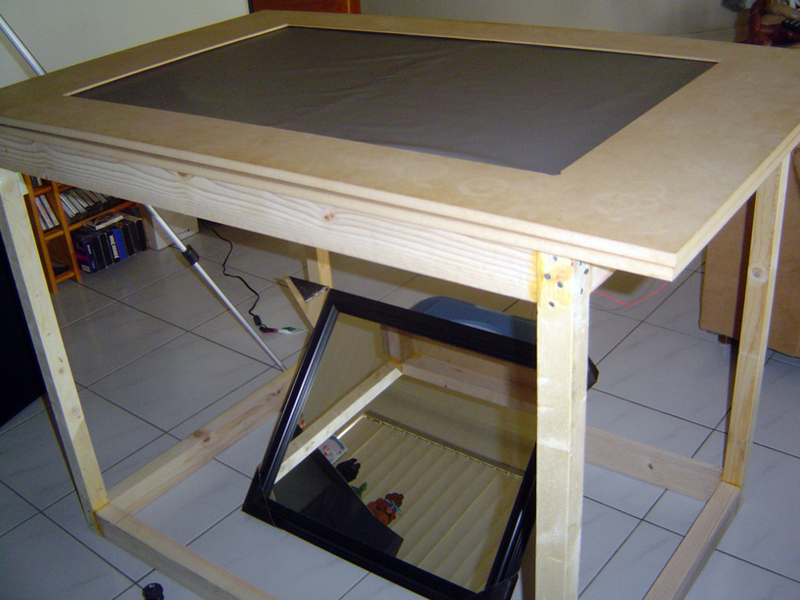 The main reasons for the frame is to keep the table sturdy and also make it so the walls of the table will be square, flush, and have something to screw into. 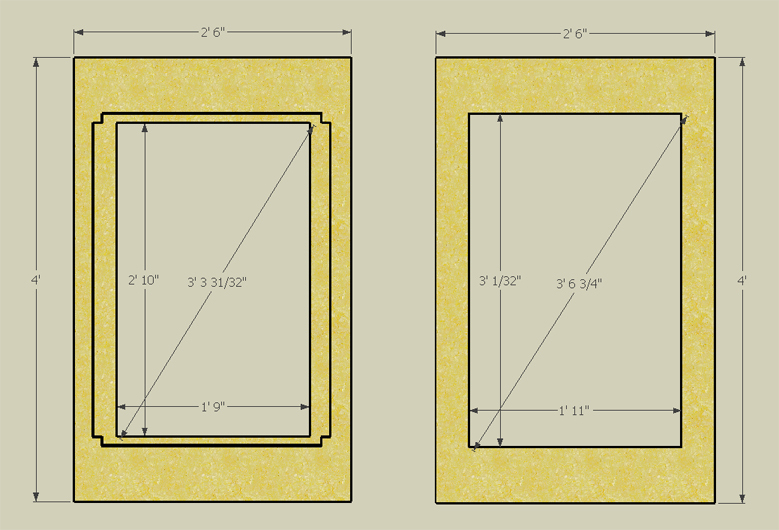 I measured out all the pieces in google sketchup and then had someone at home depot cut the pieces to size. 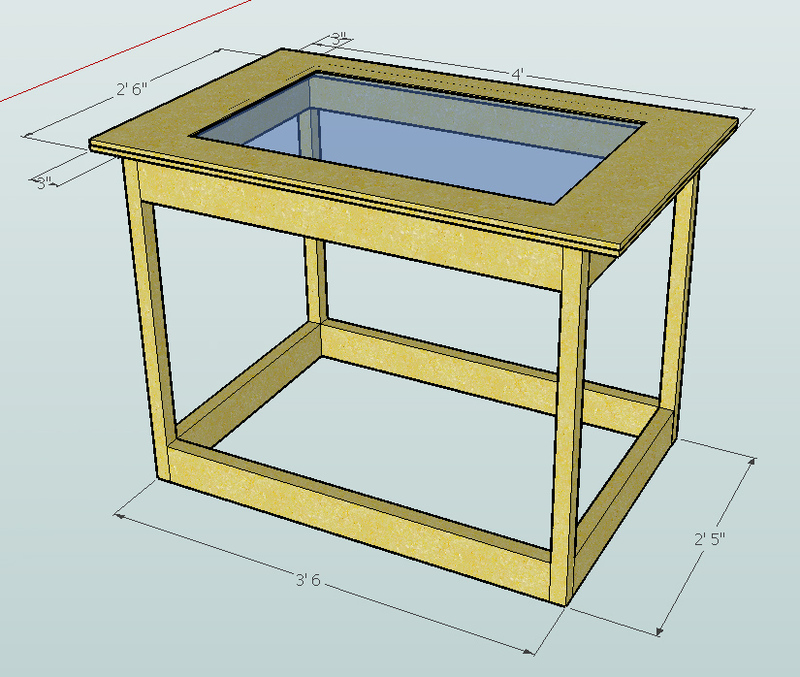 From the Google sketchup file I created, I measured and fabricated the top frame that will hold the LEDs, acrylic, silicone (compliant surface), and projection layer. 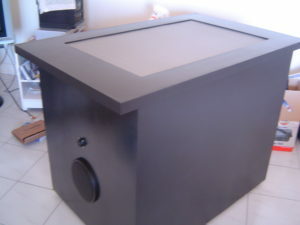 The top frame consists of two pieces; the top piece, which will fit the acrylic (in the center), along with the silicone rubber and projection material on top, and also the infrared LEDs alongside the acrylic and the bottom piece that will screw into the top piece and rest on top of the final box. View of the top and bottom pieces (with acrylic and LEDs sandwiched in between). Thanks to Adi, Deej, and Muhneer I now have video footage of my current applications running on a finished multi-touch display. Now I have an idea how the applications look on a finished display and what kind of changes may be needed. 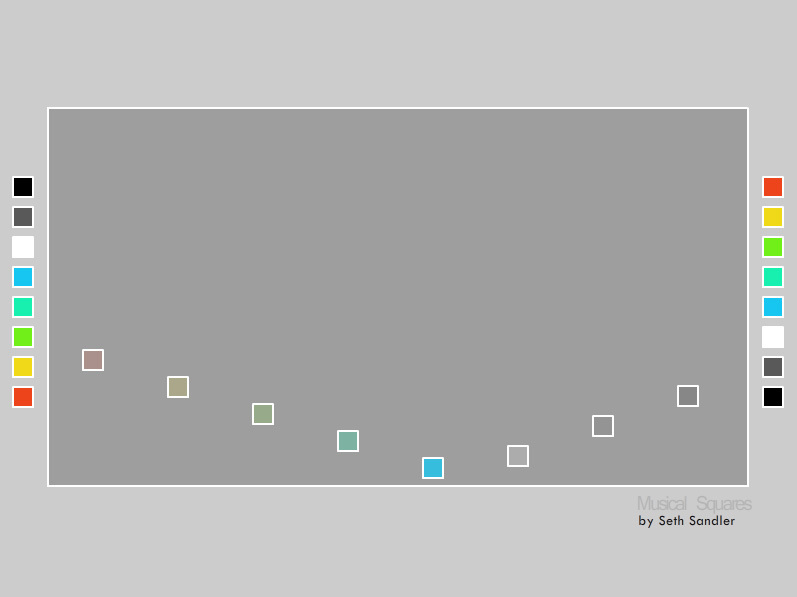 Well, I’ve made some additions, some changes and came up with an overall complete version of Musical Squares. Complete does not mean finished though, expect massive updates and much more functionality. This version is good enough to be called “Version 1” I would say. In this version, I changed the 8 original notes to 5 notes (pentatonic scale) with 3 percussive tones. It sounds…well..interesting. 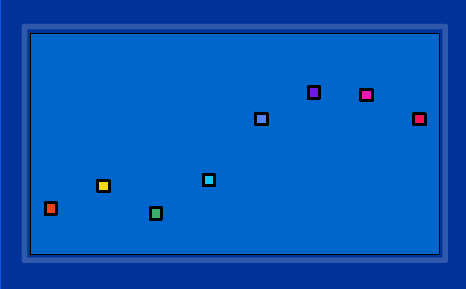 I also added the ability to remove squares by dragging them outside the main stage and adding new squares by pressing on the colored squares on either side. Well, Musical Squares isn’t anything like Musical Chairs, but it’s fun nonetheless. Who wouldn’t like throwing around objects that emit tones (sounds) when they hit each other? I started working on this second music program as an aim to explore other musical possibilities. Right now there’s not too much functionality, and it’s a basic proof-of-concept as there isn’t much practical application for it yet. 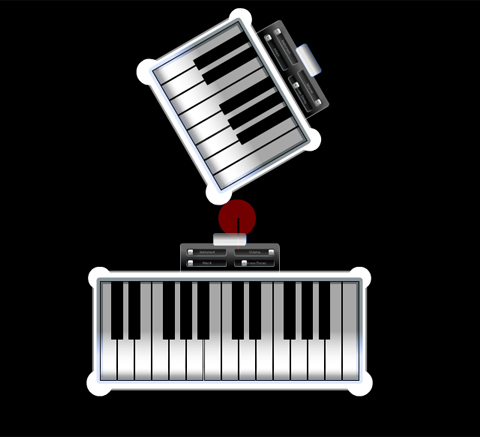 It’s based off another existing (single touch) online program called “Pianolina” that I hope to improve and build off of. The most recognized aspect between the original application and this one will be the multi-user, multi-touch aspect.